Home LocalTalk Dr. Jennifer Penrose: it is Not Normal to Shrink as You Age! Dr. Jennifer Penrose: it is Not Normal to Shrink as You Age! Here is a video where Dr. Penrose talks about how it is not normal to shrink as we age and that might be indicative of soft bone and the vertebrae having small compression fractures. Compression fractures are often silent (meaning you don’t feel pain) you just notice height loss. 700,000 compression fractures happen a year and MOST are silent. Here is the link to video. Shrinking may mean that you have soft bone! It is important to report your shrinking to your doctor. If you know that you have soft bone it is important to work towards better bone density by following the latest evidence! Did you know more studies are showing that specific high resistance and impact exercise is slowing bone loss and even increasing bone density! This is good news! The question is do you feel confident doing it or would you like someone to show you what to do safely! We are starting a group strength training & posture class for osteopenia and osteoporosis based on the latest evidence of which exercises actually increase bone density! You are looking for a place to do a group strength training class geared towards osteoporosis and osteopenia. You wonder how much weight is enough to stimulate bone density but yet not too much to cause a fracture. Classes will meet on Saturdays at 9:00 a.m. -. 10:00 a.m. at Penrose & Associates Physical Therapy in Lacey,WA. Call us to register. $25 per session or if you sign up with a friend and purchase 10 sessions it is $20 a session! Limited class size to 12 people so please RSVP early. Spots will go quickly! Email info@penrosept.com or call 360-456-1444. You will need to pay, sign a waiver, and register prior to a class. (We won’t be collecting payment at class as we want people to jump right in and not take away from class time). This class will teach proper form, posture, and work towards the evidenced based “high intensity resistance & impact training” (HIRIT) that showed bone density went up after 8 months of consistent training! You will be given a grid/flow sheet so you can do the workout again during the week on your own to give you even better results! Article: “High‐Intensity Resistance and Impact Training Improves Bone Mineral Density and Physical Function in Postmenopausal Women With Osteopenia and Osteoporosis: The LIFTMOR Randomized Controlled Trial.” Journal of Bone and Mineral Research. Watson SL, Weeks BK, Weis LJ, Harding AT, Horan SA, Beck BR. 04 October 2017. Quote regarding the article: “Importantly, no fractures or major adverse events were observed, suggesting high-intensity resistance and impact training (HIRIT) may be safe for postmenopausal women with low to very low bone mass, despite previous safety concerns,” report Steven L Watson, of Griffith University, in Queensland, Australia, and colleagues in the Journal of Bone and Mineral Research. Classes have been designed based on the above article and the Oregon State University 5 year study that showed increased bone density by specific exercises using the weighted vest and impact. Dr. Penrose DPT, OCS, MTC, Chris Edwards, PTA and Marissa Ang, ATC have taken the information from those articles and designed this class for you! The class will be instructed by Marissa Ang, ATC. 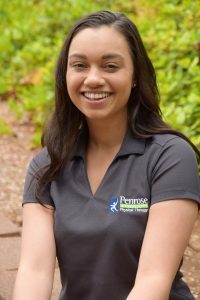 She has her Bachelor’s in athletic training and has been working closely with Dr. Penrose on designing the osteoporosis strength training class to give you the best experience. **Other classes like Tai Chi balance and Yoga for osteoporosis will be starting in a few months! We will keep you posted on those group exercise classes as well! If you want to download our FREE tips report on osteoporosis please go here: https://penrosept.com/osteo-website.